Does the 14th Amendment Include children of Illegal Immigrants? 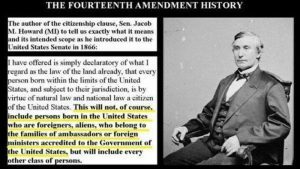 The Author of the citizenship clause, Senator Jacob Howard, who comments on the intended scope of the 14th amendment in 1866, declares that this does not extend to persons born to foreigners, aliens, or children born to ambassadors and ministers. Michael Anton of Hillsdale College called birthright citizenship “an absurdity — historically, constitutionally, philosophically and practically.” That is a dramatic overstatement, but the practice is not the most obvious default either. If the U.S. could provide citizenship for everyone on earth, standards would not matter. But if Americans are not prepared to do so — and that seems, well, highly unlikely, to put it mildly, in the current political climate — they must make choices. Assume there is some practical limit to the number of people likely to be granted citizenship: might it not be better to accelerate acceptance of, say, long-term Green Card holders, or some other category of applicants, instead of everyone born in America, irrespective of circumstance? Americans in 1868 never imagined how the amendment would be used. It was approved to overturn the awful Dred Scott decision, which denied citizenship to slaves, and protect the Freedmen, guaranteeing their citizenship no matter what future Southern governments might desire. The meaning of the main clause is clear, but the jurisdiction restriction is less so. Excepted by contemporary policymakers were children of diplomats and Native Americans. Children of foreign invaders, Americans were assured, also would not be offered citizenship. But legal aliens were accepted, an interpretation affirmed by the Supreme Court in 1884. It takes a strained reading of the provision to exclude foreigners who entered the U.S. under the rules established by Washington and voluntarily placed themselves under the jurisdiction of U.S. legal and political institutions. Not covered, however, was the status of illegal aliens. America’s borders then were essentially open. Thus, there were few children of illegal aliens to become citizens. Even after restrictions were imposed, the number of illegal immigrants remained modest. The 1986 immigration legislation made it more difficult for people to travel back and further across the border, encouraging Mexican migrants, in particular, to bring their families and stay, creating a semi-permanent, family-heavy illegal population. Which meant more children of illegal aliens, overall roughly a quarter of a million annually, granted citizenship. Citizenship matters. For a century and a half being born in the U.S. was enough. But circumstances change. Maybe birthright citizenship is no longer the best policy. Whether you like or dislike the president, he again is pushing for people to rethink once settled policy. For that he deserves credit. Doug Bandow is a Senior Fellow at the Cato Institute and former Special Assistant to President Ronald Reagan. A graduate of Stanford Law School and member of the California and D.C. bars, he is the author of The Politics of Plunder: Misgovernment in Washington.